The UZMA HVS variable rake shears are produced by construction of Steel into a very rigid structure to allow minimum deflection during the operation. 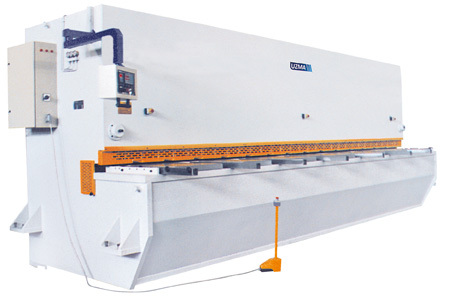 The rake angle adjustment is done hydraulically, reducing the rake gives a advantage in reducing distortion on thin narrow strips also increase the cut quality and cut per minute. Cutting beam on HVS variable rake shears has hardened slide ways working between roller bearings, so lubrication is eliminated and blade clearance adjustment can be done easily in mechanical or hydraulic system. The UZMA HVS variable rake shears can be equipped with NC or CNC control units according the customer request. If equipped with the CNC control, the operator simply enters the material type, thickness, cutting length, cutting width and the CNC will then automatically calculate and set the blade clearance, rake angle and back gauge position accordingly.